oikos » Blog Archive » Pluralist economics: coming to a classroom near you? oikos › News › Pluralist economics: coming to a classroom near you? Pluralist economics: coming to a classroom near you? Economics can be a pretty dull subject, both in the way it is presented and in the types of ideas it includes. But oikos is working to change that! 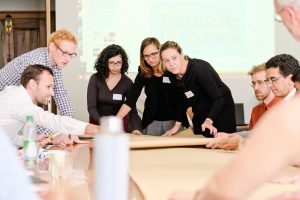 For last month’s Futurelab, oikos Associate J.Christopher Proctor led a team that developed an interactive workshop which introduced oikees to a new kind of economics. Using a number of engaging role playing games, the workshop asks participants to step into the shoes of various types of economists to make speeches, act out plays and even create ‘economic’ street art. Participants come away from the workshop with a better understanding of economic approaches such as behavioral, ecological and feminist economics, and with an idea of what it looks like to study ‘pluralist economics’ in which diverse frameworks and ideas are taught alongside one another. There is currently an active international student movement to promote pluralist economics, with groups like Rethinking Economics, PEPS-Economie, and the Netzwerk Plurale Ökonomik arguing that new ideas and critical debate are desperately needed in economics and business schools. Now is your chance to introduce your local oikos group to the world of pluralist economics! In the coming months, J.Christopher will be taking his workshop on tour to try to reach as much of the oikos family as possible. He’ll also be holding webinar-workshops for groups he’s not able to visit in person.
. And if you’re interested in a more detailed introduction to pluralist economics, check out the new book he helped edit: Rethinking Economics: An introduction to pluralist economics (discount code FLR40 at checkout for 20% off).